Paris Fashion Week is already in day 4 and I’m really excited to present some of my favorite designers and pieces from their collections. But first a little note on my love for Paris. Paris is one of my favorite cities in the world. I know that is a little bit cliché because EVERYONE is supposed to love Paris but my love relationship with Paris did not start until I lived there. In fact on my very first visit some 11 years ago I was very unimpressed and could not understand why everyone was so charmed by this city. Years later, when I was lucky enough to spend 4 summers in a row in the capital of CHIC I finally understood it’s magnetic allure. Amongst all the usual suspects that Paris does best like Macarons , foe gras, fashion, art, joie de vivre what I love most about Paris is the sheer history that spans over 2000 years and encompasses some of my favourite eras. You can feel and touch the history all around you. Every building you see has a historic moment tied to it whether it was a famous moment in history or . 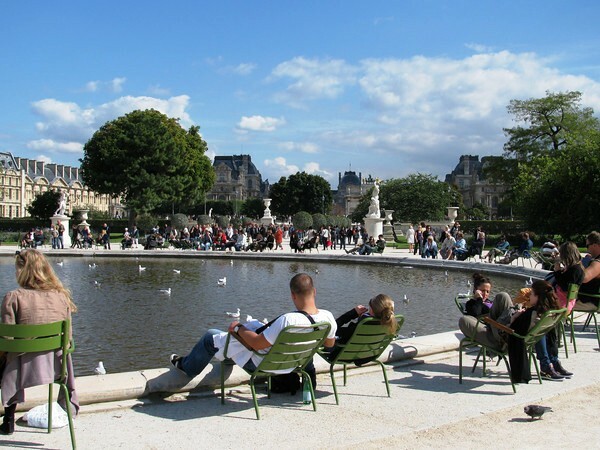 What I enjoy doing while in Paris it to take a picnic spread and sit by the fountain in the Jardin de Tuileries directly across from the Louvre. On a warm summer day it is such a beautiful sight and feeling to sit there and imagine how the Louvre was 100, 200, 300, 500 years ago and get lost in that world. Below is a picture of that view.